Before heading out to Destin, Mary and I had one mission in life – to find my Maid of Honor dress for her upcoming wedding. We had looked online, and I even visited a few places close to home, but we just couldn’t find the right one. Now, something I realized this week – having never been the “Maid of Honor” before, was that the COLOR of the Maid of Honor dress is MAJOR important. When you think about it, the Bridesmaids are really the “focal color” of the whole event – since the Bride is in white and the groom in black or brown. 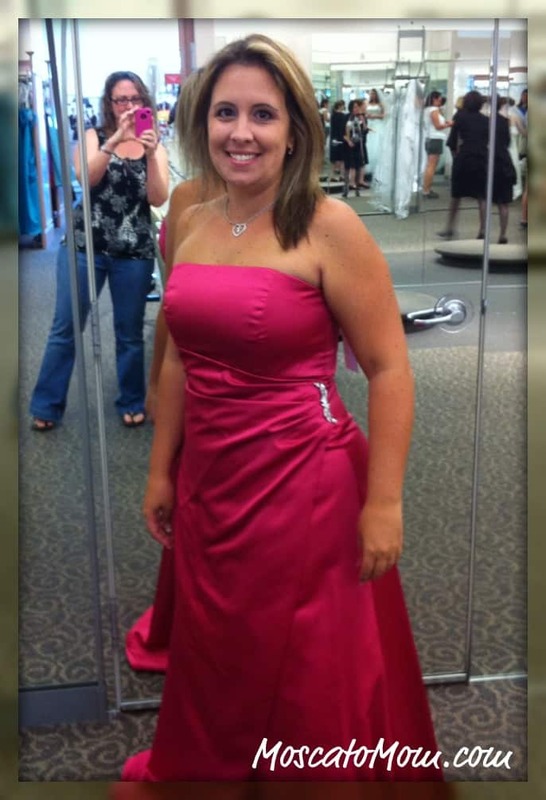 When I got married, I picked the color first, and then left it up to my poor best friend to find a matching dress. Mary, thankfully, knew better and we shopped together at David’s Bridal and found not only the perfect dress, but the matching sash for her to wear, and about a million things to coordinate with the color. It had never crossed my mind that MY dress was THAT important – and the reason we needed to decide on it NOW so she would have the color – literally for everything else. Talk about an “ah-ha” moment. In case you have been under a rock for the last 60 years, David’s Bridal is the premier wedding retailer for all things Wedding Dress related – from the Bride, to the Flower Girl to the Mothers of the Bride and Groom. They even offer all of the shoes, accessories, hair pieces – even invitations and reception pieces to match your theme or color. My favorite part is that at David’s Bridal you are able to purchase your dress straight off the rack – which is a great perk when the wedding is less than 2 months away. They have something like 40-something different styles that can come in any of the 30-something different colors (I should have taken a picture of the chart… its impressive) and in case they don’t have the perfect one, you can order it and they can get it in pretty quick. So here it is – the “perfect” dress and the color for this beautiful beach wedding – I can not WAIT! I think I am *almost* as excited as the Bride! OH WOW you look gorgeous…just breathtakingly gorgeous. I’m soooo excited! Now you understand why I needed you to pick your dress. I’m glad you understand why because I love you girl. I know there are going to be sometimes I’m going to be really stressed out please remember that I love you bunches and I really, really appreciate you! Hahaha YES!! It made sense once you SAID it! LOL And yeah, I am getting good at putting up with your stressed out self… just keep thinking “it will ALL be worth it… it will ALL be worth it…” LOVE YOU! How beautiful!!!!!!!!!!! That color is stunning on you….and I think that the ahem….boost of the bust…was a great choice!!!! Beautiful, Lyns, just beautiful!!! Kisses and hugs from me and the fam!!! Oh, Lynsey you beautiful, as usual! That dress is so flattering on you – and yes, the girls help the effect. I love the bling on your hip, it is so pretty. I know that you and your friend will have a wonderful time at the wedding. I can’t wait to see photos! BTW, kudos on the weight loss, keep up the good work. Now know how Kimberly felt. Planning a wedding is very stressful. Now I understand why she needed so many bridesmaids. Sorry I only have one. I love you girl and I thank you very much for stepping up to the plate, we’re going to hit a homerun!!!! Woohoo. Sorry got off focus and it’s football season. 😉 We’re heading to the end zone. Lol! and you will never believe this… my maid of honour (actually, I had two, lol) had near identical dresses in just a different colour. Fab, fab choice!!! That dress looks soo pretty on you! That color totally is your color too! Oh my gosh! It’s SO pretty!! You look gorgeous in it. It’s going to be a beautiful wedding! That color is perfect on you. How exciting to find the perfect dress so quickly. Wow! You look gorgeous Lynsey!